This heartwarming and simple, spicy pork preparation is sure to hit all your senses and get your tastebuds dancing. Chicken Stock: 1 cup made with 1 oxo chicken cube. Ginger powder/ paste : 3/4 tsp. Water to make thick paste. 1. Prepare the marinade by mixing all the marinade ingredients into a thick paste. Adjust its consistency using water. Taste for salt and sourness and adjust accordingly. 2. Apply marinade to pork ribs. Keep aside for an hour or more. 3.Place a large non stick pan on the fire, add oil. Once oil is hot add the pork chops in a single layer and fry for a couple of minutes on each side to seal the meat. Then add the chopped garlic flakes and chicken stock cover the pan and cook on low to medium heat till done and almost falls of the bone. Add more water if needed to cook the meat. 4. Once the meat is cooked, open the lid and allow most of the gravy to dry up on a high flame. Taste for seasoning. Garnish with freshly chopped coriander leaves and a squeeze of lemon if required. Serve hot with an accompaniment of creamy mashed potatoes and a fresh salad. 1. 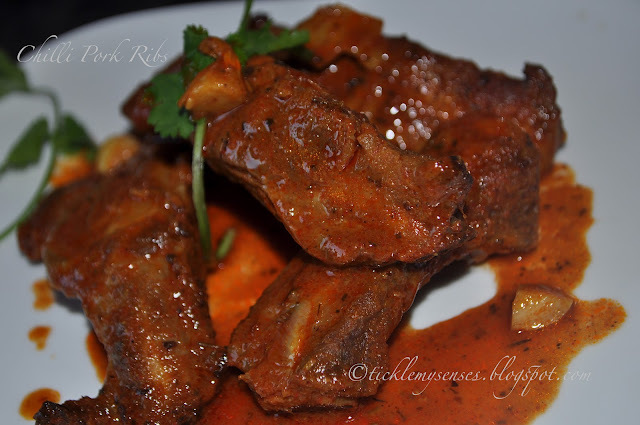 Substitute the red chilli powder with Mangalore Baffat powder for Baffat style pork ribs. i dont eat pork but you have presented well..
wow...loved the flavours!! Looks so tempting! Thankyou PT and Teena Mary. 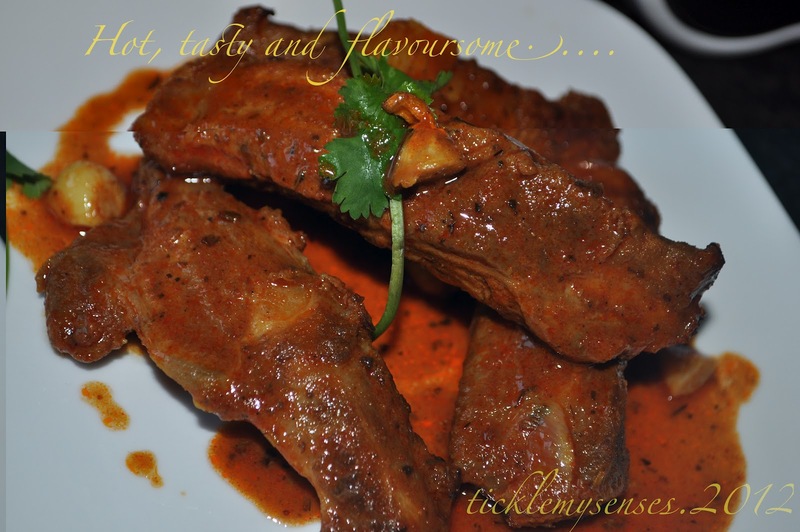 Sweta thankyou for trying this recipe and leaving your feed back. Im sooo glad you and hubby loved it!! What a simple and gorgeous recipe. It has become a family favourite.